Come to Cannon Design's Fifth Annual 'Exhibit A'! 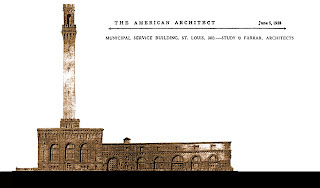 Thursday 18 April 2013 from 5:30 to 8:30pm in Cannon Design's uniquely re-imagined municipal Power House located at 1100 Clark Avenue, Saint Louis, Missouri. This year's photographs include my image "View from Arch" matted and framed. 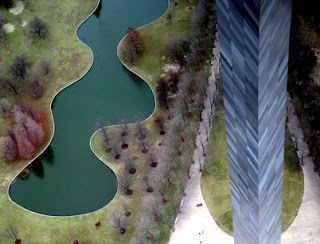 View from the Arch. Photograph © copyright Andrew Raimist. All proceeds from the event this year go to support the St. Patrick's Center in downtown St. Louis! 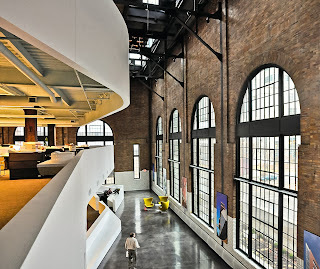 Cannon Design achieved a remarkable construction with their St. Louis architectural office ("Power House") which has the feeling of being a elegantly design ship-in-a-bottle (or perhaps "space-ship in an abandoned industrial coal plant" would be more accurate). Cannon Design –– interior. Photograph copyright © Andrew Raimist. Their design –– lead by architect David Polzin, AIA, LEED –– floats a series of new suspended floor plates from the existing structural steel columns in connection with two existing masonry bearing walls. By holding the floor plates free of the two facades with monumental sized windows, an incredible sense of lightness, openness and space is created. This structure could have very easily been subject to a developer's logic: jam as many floors as possible into the box and utilize even square inch of rentable space by slamming the new floor plates up against the series of arch top windows. 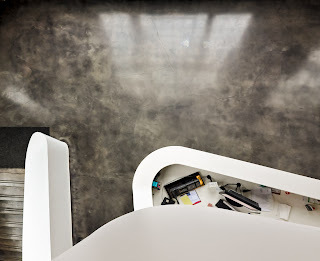 Cannon Design –– looking down on desk. Photograph copyright © Andrew Raimist. 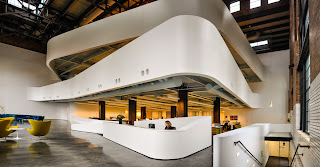 A new form-language is used for the inserted materials: curvilinear white plastered surfaces which contrast beautifully with the patina of corrosion on the existing steel elements as well as the rich reddish-browns in the heavy exterior masonry bearing walls. The base of these walls is clad with white glazed tile, a functional touch that would allow for cleaning the walls at the ground floor. 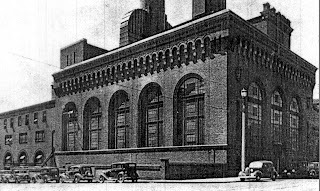 Originally, the monumental volume was filled with massive boilers and two enormous smoke stacks to disperse the smoke from burning coal which provided steam heat to a section of downtown in the area of City Hall and the Civil Courts Building. 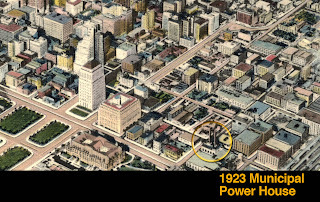 Excerpt from an aerial view postcard of St. Louis with Power House location indicated. The original Power House structure was massive, monumental and designed in a Florentine Renaissance manner drawing upon Palazzo Vecchio for its inspiration. The following elevation was published in The American Architect with design by Study & Farrar, Architects. 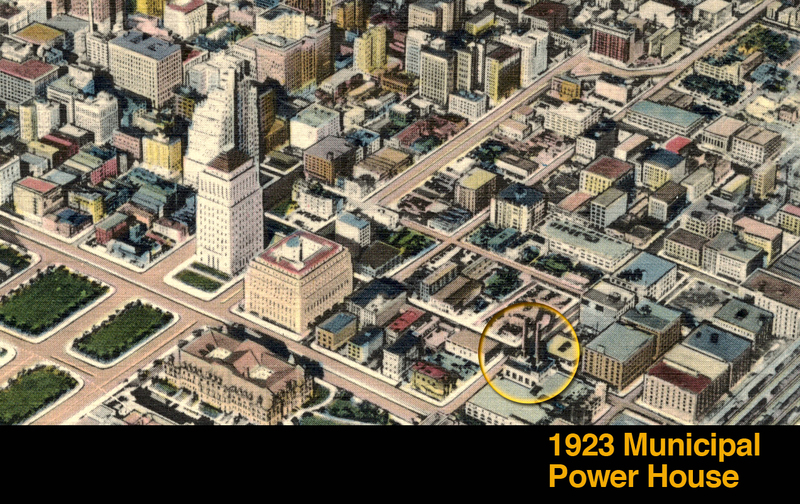 The Power House structure stands taller than the rest of the block with two monumental smokestack towers. As built, the structure provided an expressive, richly textured contribution to the city's urban design. The structure clearly received a great deal of thought and consideration given it's location (within view of City Hall) and its important function. It's hard to think of a contemporary functional building dedicated to power generation that has the grace, proportions and presence this structure has. 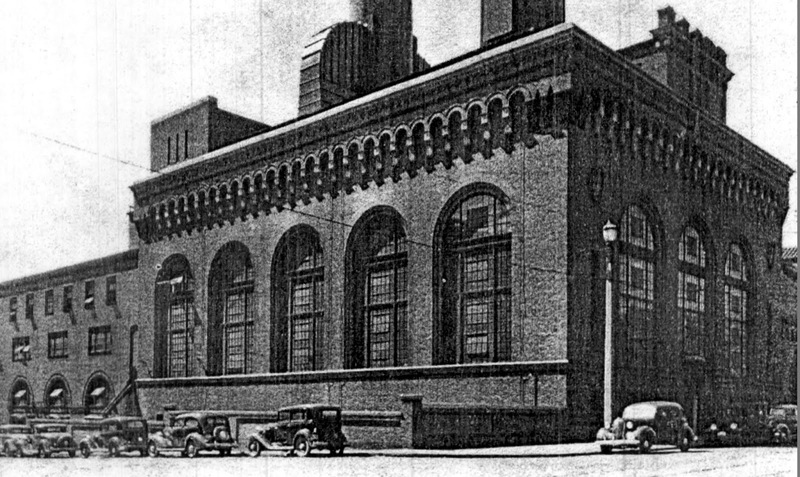 View of 1923 Municipal Power House. The two smoke stacks are cropped out at the top. 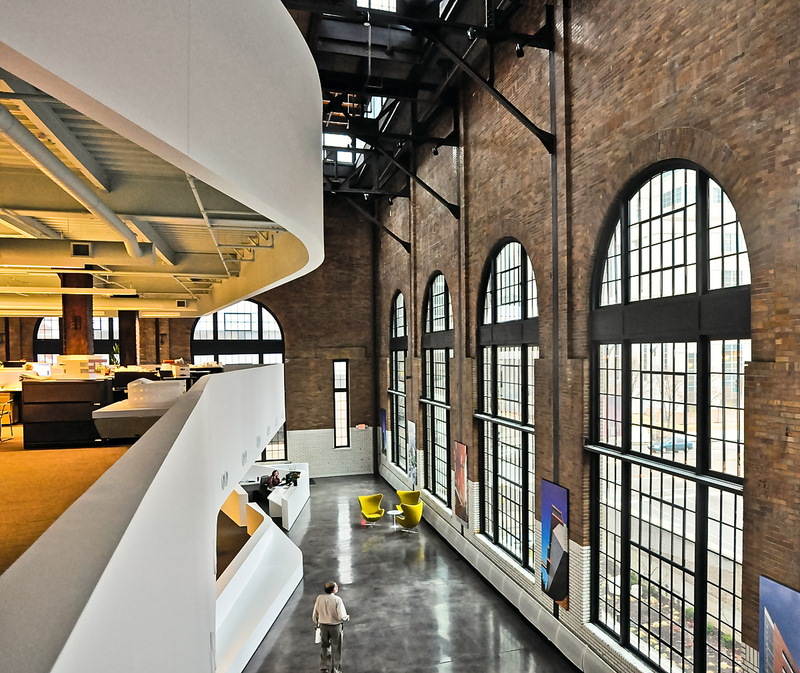 Cannon Design intelligently kept the new floor plates away from the monumentally scaled windows. Historically accurate new windows meeting today's energy standards were installed as a part of their Platinum LEED certified adaptive re-use of this ninety year old building. 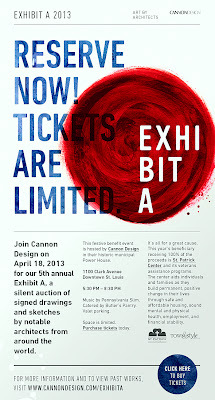 The entire building will be accessible for touring and viewing during Exhibit A: the silent auction of art by architects to be auctioned this Thursday 18 April 2013.